Who was the most underrated and overrated AFL team in 2009? The AFL season is fast approaching, and even this weekend the pre season cup will start. So just for a teaser for the start of the AFL season, we will look at what teams were the most underrated and overrated teams of 2009. Interestingly Adelaide are at the top of the table. 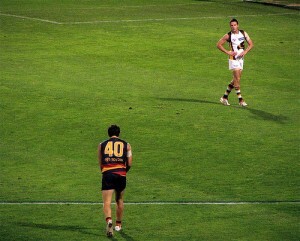 Tipped by many to miss the eight, the crows shocked almost all by making the finals, but were only a goal or a few seconds away from playing in a prelim. Brisbane also performed greater than expected and finished in 6th position as did Collingwood who finished 4th. St. Kilda would have been cruising on top of the table above until they lost consecutive matches to Essendon and North Melbourne at odds of 1.14 and 1.08 late in the season. The premiers Geelong, made the most profit. On the other side of the table, reigning premiers Hawthorn looked like anything but. Sportpunter tipped them to finish outside the eight despite winning the premiership the year before, and we collected big against the hawks. On average in 2009 the hawks had 10 premiership players missing – that’s half a side, and impossible for any team to make up. Port Adelaide played below expectations, and Fremantle and Richmond would have to be the two most overrated teams in the competition. Interestingly third placed Western Bulldogs is on the lower half of the above table, but that was largely due to their 1.07 home loss to the West Coast Eagles. I will soon do a write up about what to expect in 2010 for AFL, but in the meantime, make sure you sign up to the Sportpunter AFL model. We made a massive 21% ROI last year, and the record over the years is second to none. Two things of note with this chart. 1. Already trialled it & you would get smashed in any tipping competition, even if you factored in home advantage on the betting. LIne betting, though, is more interesting. 2. This US type betting shows us that the bookmaker has no reason to whine week in week out. PS: I’m sure you’ll find the Bombers finished around 3rd place head to head. not sure what you mean by geting smashed in a tipping competition? but yes line betting is more interesting. Yeah so true. The general public don’t seem to understand the concept of value at all. I recently tried to chat up some bird at a bar, and ended up talking about the EV of a coin flip given certain pay out odds. She couldn’t understand the theory of positive long term expectation. She then accused me of being a problem gambler that needed help! LOL! Note to self: Don’t talk to women about ‘gambling’. Experimented with every game last season & hypothetically tipped the winner with the most money gained after using the same method as your table. Ended with 114 out of 176, but the line betting was more successful. Interesting. As far as tipping goes. If you tipped every team that had greater than a 50% chance of success according to my probabilities last year you would have tipped 130 winners from 185 including finals.